South East Asia has a population of a billion people, set to double to 2 billion by 2050. It has an incredibly young demographic, and a rapidly growing middle class with disposable income. Many of these people will be your next customers. But it’s also an amazingly diverse region, from the skyscrapers of the city state of Singapore, to the thousands of islands that make up Indonesia. Developers who live the region will tell you about their homelands, how the web differs from that in Europe and USA, the challenges they face, and give you a head start when it comes to serving new customers from the region. Tuesday, December 18, 10:00AM EST. South East Asia has a population of a billion people, set to double to 2 billion by 2050. It has an incredibly young demographic, and a rapidly growing middle class with disposable income. Many of these people will be your next customers. But it's also an amazingly diverse region, from the skyscrapers of the city state of Singapore, to the thousands of islands that make up Indonesia. Developers who live the region will tell you about their homelands, how the web differs from that in Europe and USA, the challenges they face, and give you a head start when it comes to serving new customers from the region. 45 mins + Q&A. Tuesday, December 18, 10:00AM EST. 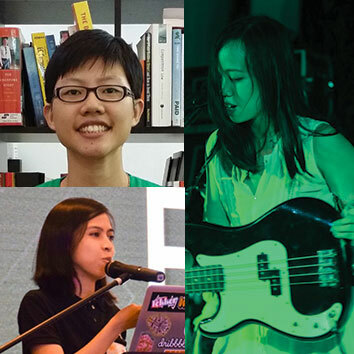 Chen Hui Jing is a self-taught designer and developer living in Singapore, with an inordinate love for CSS, as evidenced by her blog, that is mostly about CSS, and her tweets, which are largely about typography and the web. She used to play basketball full-time and launched her web career during downtime between training sessions. Reducing lines of code in her web projects makes her extremely happy. Eka Jayani Ayuningtyas is a frontend developer based in Yogyakarta, Indonesia. Having fallen in love with building websites as a pre-teen, she had followed the web design and development world independently for over a decade before finally working full-time in the field. When not coding, she is probably playing bass guitar, tinkering with the local interdisciplinary art community, or trying a new recipe. Sophia Lucero is co-founder of the Philippine Web Designers Organization, a volunteer grassroots group that organizes the Form Function & Class conference. She is a fan of cats, travel, DIY vlogs, productions, procrastiworking, and the Web. Smashing TV is a brand new series of webinars and live streams packed with practical tips for designers and developers. Not just talks — conversation with “show-me-how-you-work”-sessions. Smashing Members can download recordings, too. Think of it as some sort of a Hollywood blockbuster with cats. Just better, because it’s for people like you. Check upcoming webinars.